Feeling the minor aches and pains of growing older? 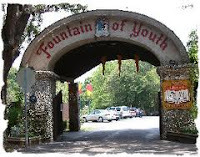 Ponce de Leon’s pursuit of the Fountain of Youth has obvious attractions to us “baby boomers”, but a sprinkling of the magic water on tomatoes would also be nice. We’ve long been frustrated by the often lightning fast transition from fully ripe to over-ripe fruit that is characteristic of many heirloom tomato varieties. The window for peak flavor/texture can be somewhere between several hours to a couple of days. 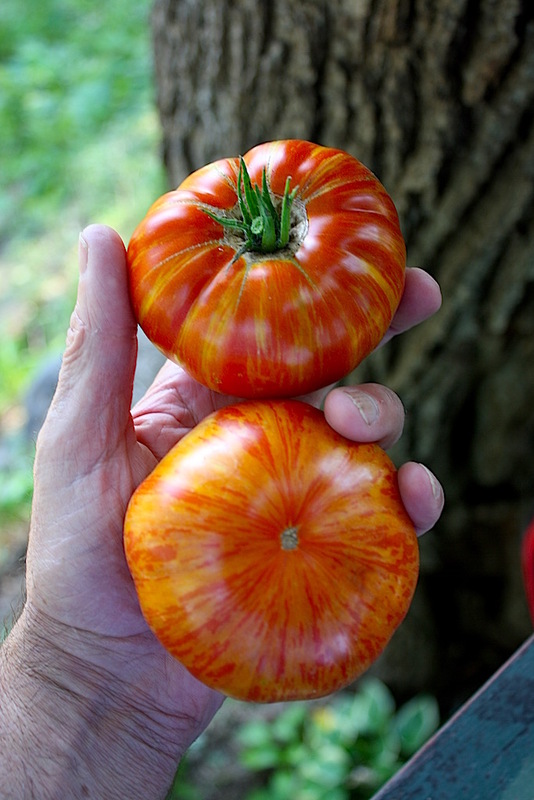 Our friend and tomato guru Brad Gates calls this the "melting popsicle". To compound the problem, just when the fruit approach peak ripeness they also start their most fickle period for cracking/splitting. 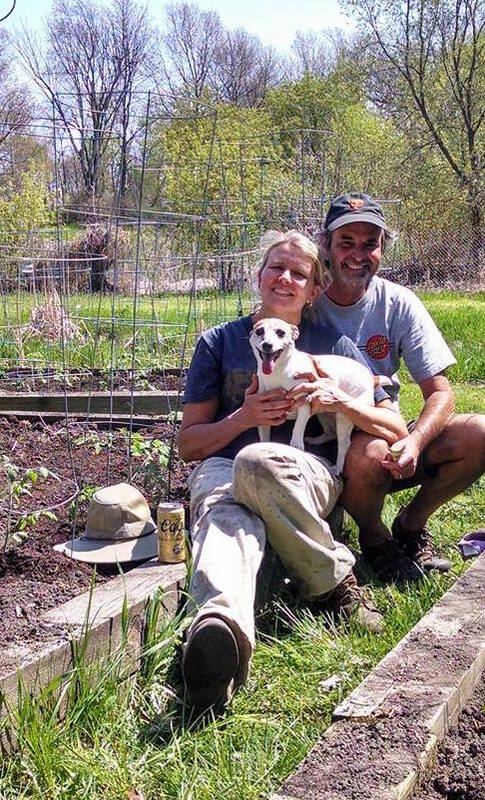 It’s bad enough for the backyard gardner who can pick daily and simply carry them into the kitchen, but for market growers even picking and distribution for local markets is tough with most heirloom types. 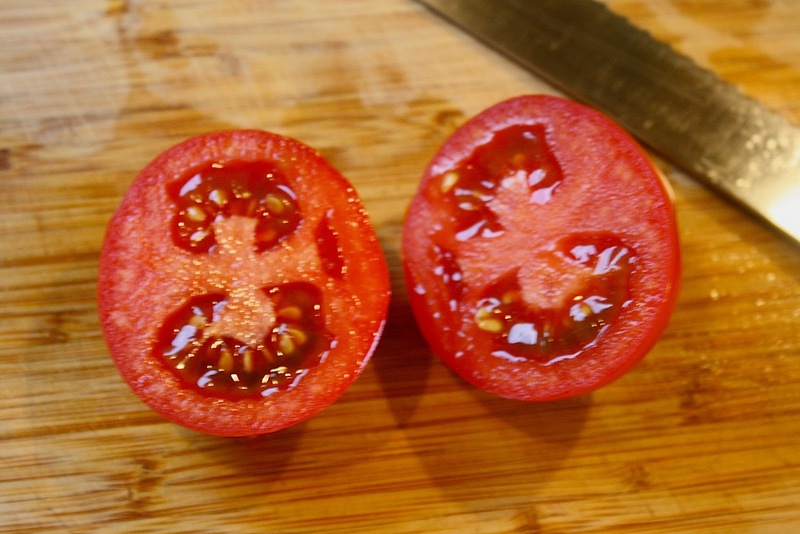 Fortunately there are genetic tools for breeders to extend “shelf life” of tomatoes. 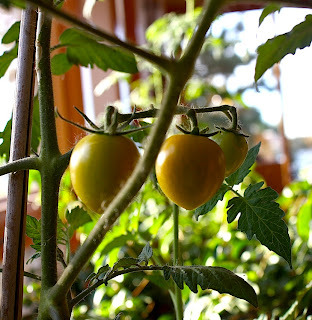 The technology for long shelf life (LSL) tomatoes has been around for decades. This started with Calgene’s failed commercial attempt at LSL in which they used genetic engineering to down-regulate a gene coding for an enzyme (polygalacturonase) involved in fruit softening (FlavrSavr). This was followed shortly thereafter by the discovery of naturally occuring (non-GE) mutations in several transcription factors regulating various genes/pathways involved in fruit maturation/ripening (e.g rin, nor and Nr) - a review article can be found here. There are a number of new GE approaches as well, one of which is referenced, but not discussed here. The “rin” allele, is a mutation in a gene that regulates ethylene biosynthesis and specific plant responses to ethylene (reference). The plant hormone ethylene is a trigger for a cascade of physiological changes associated with fruit ripening. 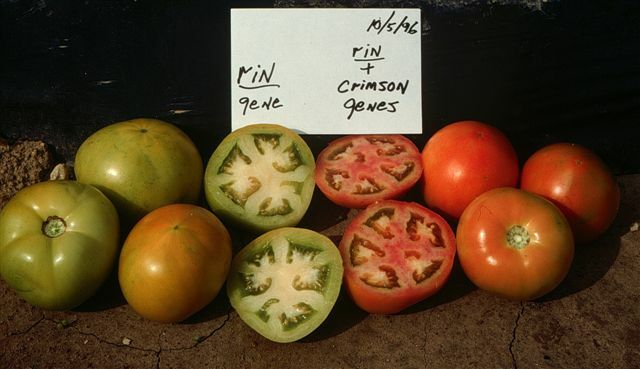 The recessive “ripening inhibitor” (rin) allele in it’s homozygous state prevents normal ripening of the fruit. 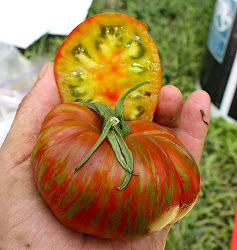 A rin phenotype at peak ripeness has mature seed, but without normal fruit coloration or fruit softening. 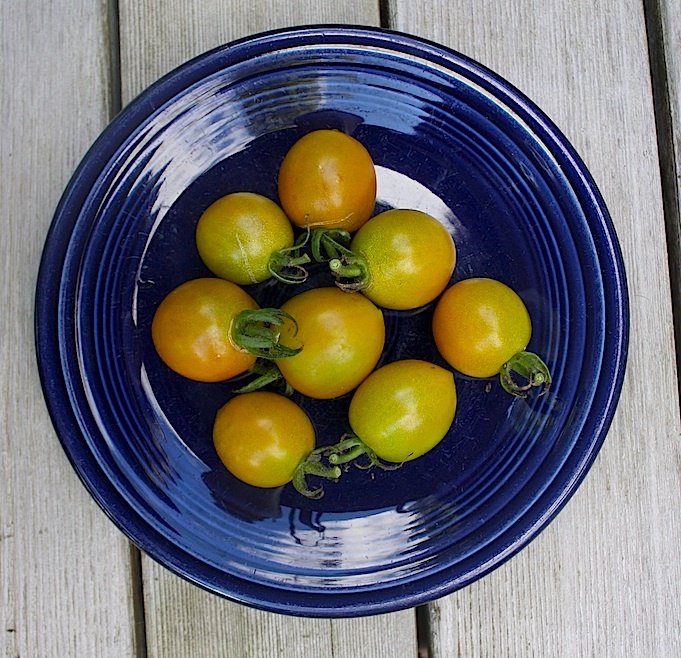 These fruit tend to be crispy, green/yellow, and without much flavor. 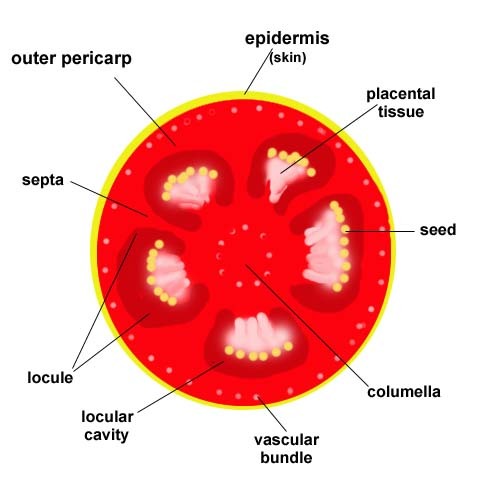 In the heterozygote state +/rin the fruit will ripen to normal color and flavor, but on a delayed timeline and maintaining the “ripe” phenotype for an extended period of time – thus, LSL (reference). The rin technology was discovered in the 1980’s and patented soon thereafter. 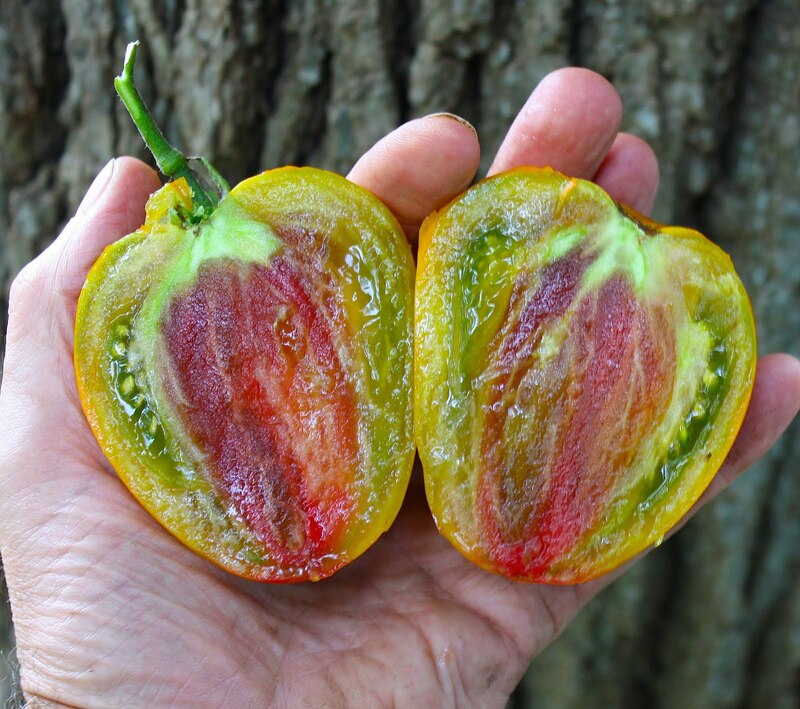 It is currently off-patent and widely used by commercial tomato breeders developing “vine-ripened” hybrid cherry, grape and cluster tomatoes, produced in Mexico and marketed in the U.S. every month of the year. 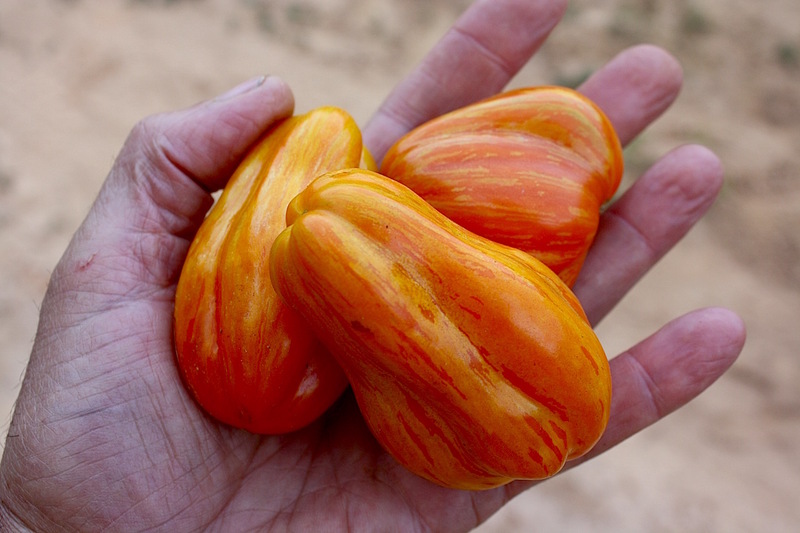 It is a breeding challenge to combine +/rin (only possible in hybrids) with normal fruit color and exceptional flavor – but Mountain Magic and several others have cleared this hurdle. 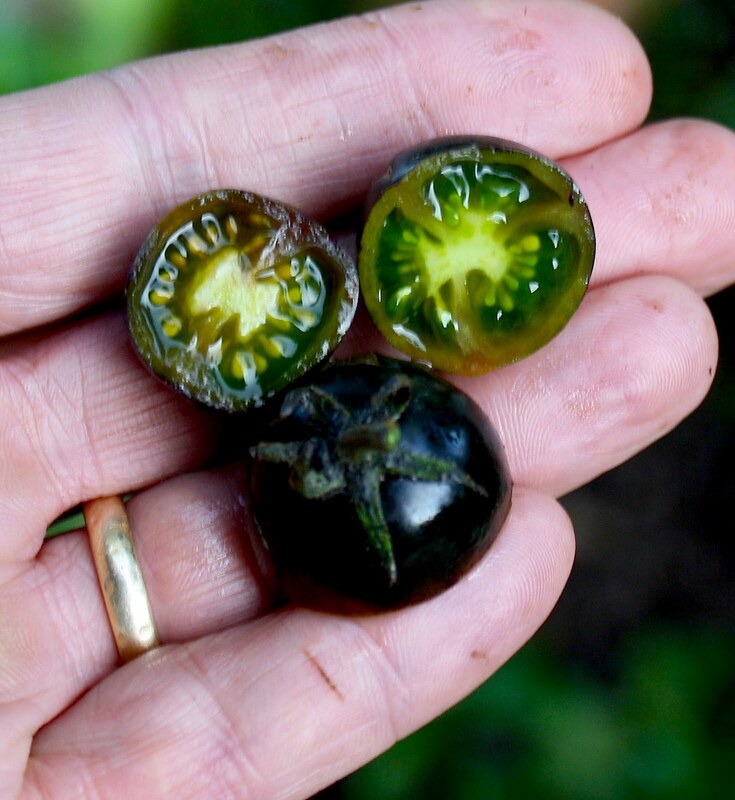 We are in the early stages of developing parents for great tasting, great looking, LSL “rin” hybrids that incorporate best-in-class flavor from heirlooms, and LSL, crack/splitting resistance, and multiple disease resistance from commercial hybrids. 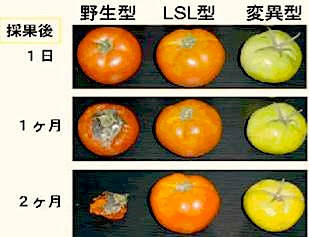 In addition to the novel alleles for genes affecting normal fruit ripening, there are other components to LSL (reference). Fruit firmness is intimately related to LSL and is significantly impacted by epidermins/epicarp composition/toughness, strength of pericarp cell walls and connections between cells in the pericarp. The ratio of pericarp to locular material also seems to effect firmness. A “tougher” epidermis also helps resist cracking/splitting. There is significant genetic variation for all of these traits. Ofcourse there is a caution here, a fruit can be too firm or have skin that is too tough. Moderation is the key – finding the “sweet spot” in fruit firmness/skin toughness that helps fruit quality but doesn’t negatively impact taste and mouth feel. While commercial tomato breeders have done an excellent job improving fruit firmness and LSL, it has often been at the expense of fruit flavor. The NCSU release “Mountain Magic” and the new U of Florida “TastiLee” are two examples of good tasting new hybrids combining these multiple favorable traits, but we think there is a lot of opportunity in this area for artisan breeders. 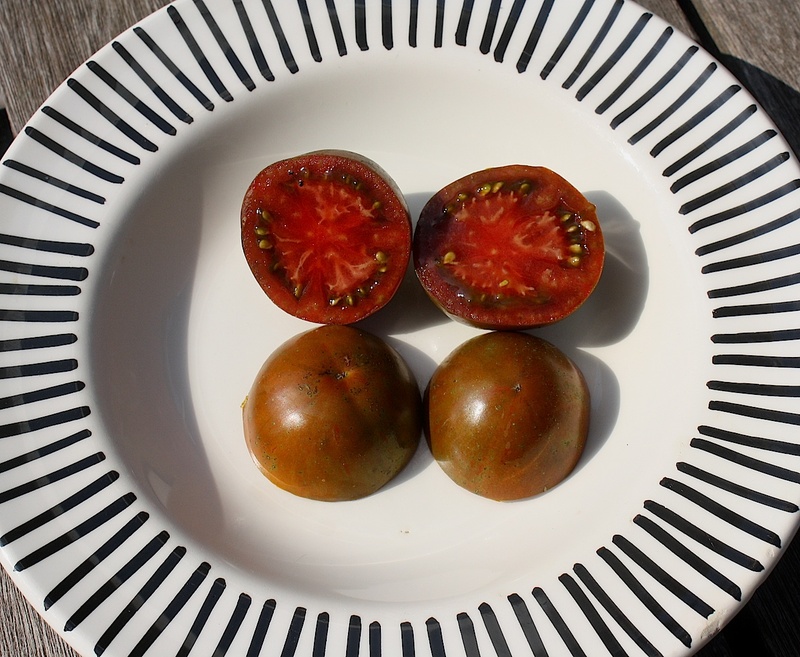 We have F3/F4 striped cherries with great taste and virtually bomb proof for cracking – even after a rain. These new cherries also have better hang time on the vine. We are a little farther out on rin lines, but making progress. All of these LSL breeding lines are derived from crosses between our heirloom-derived breeding lines and commerial hybrids, so we are also picking up multiple disease resistance. Last year we made crosses to a couple of larger fruited commercial rin hybrids, and have F2 growouts this winter. 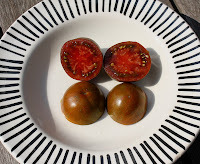 The goal is to add a few days of shelf life and better crack resistance to heirloom-derived varities – that are fun to look at and great tasting. We’ll be posting updates. January 2012 photo from the greenhouse: a F1 fruit from a striped cherry x GVS 51800 cross. 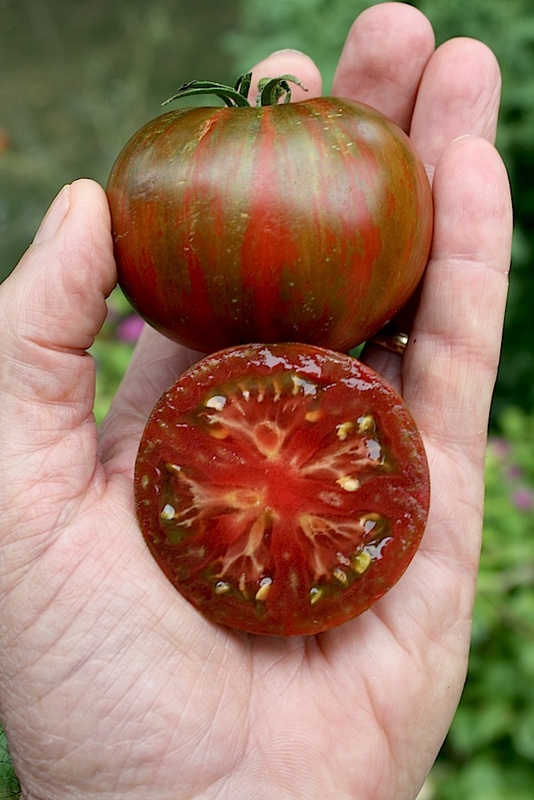 Fruit size similar to GVS 51800, with more pronounced stripes than I expected in a gs/+ plant. This is one of several F1's from such crosses that will go to the field as F2 progeny next summer. October 2012 update - several good selections from the GVS F2s - all w/ stripes. Also many new crosses to Tasti Lee. 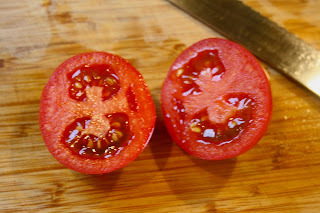 November 2012 photo of fruit of three crosses to our rin/rin cherry. The larger two are almost ripe. Ripe fruit stage on a rin/rin line is a dull green yellow. 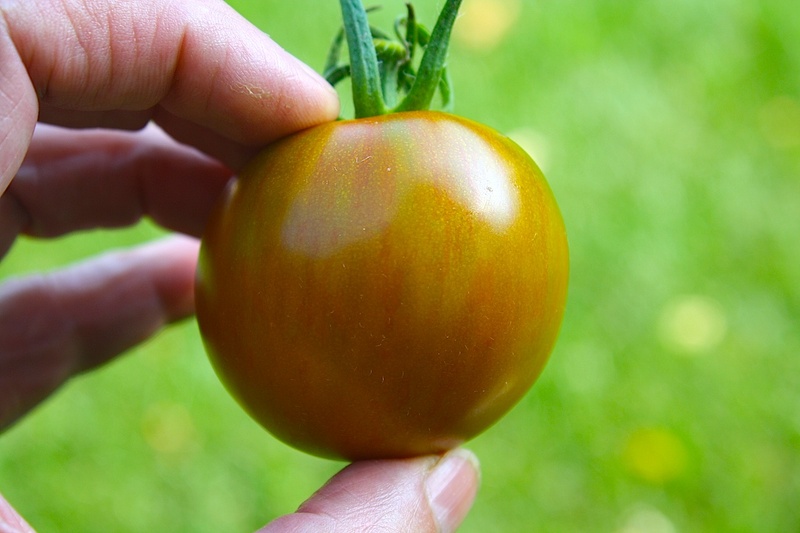 The rin/+ hybrid will have normal color and the desired delayed ripening/long shelf life (LSL) characteristics. Next summer we should have the rin gene introgressed into several of our best breeding lines. August 2013 update - progeny tracing to crosses between FLF x commercial hybrids are looking very good. We are seeing much improved fruit quality (e.g. tolerance to cracking and improved shelf life) combined with stripes and exceptional flavor. 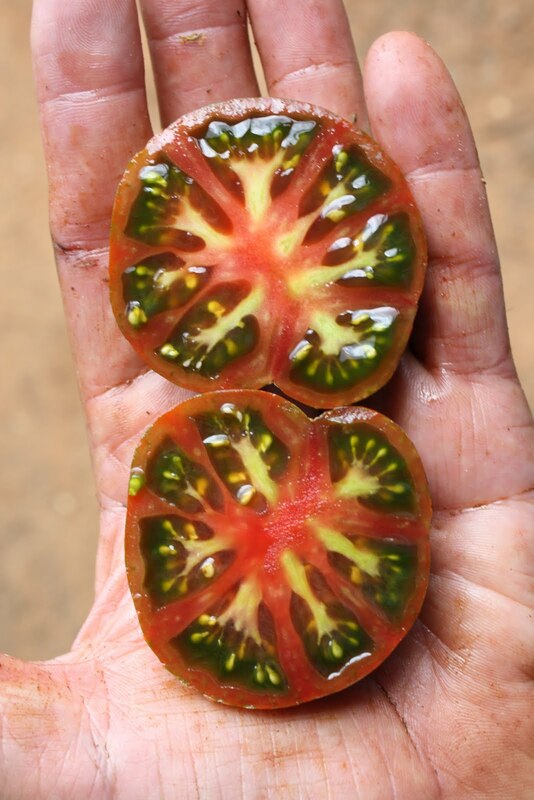 This photo of a fruit from a F2 plant heterozygous for both gs and rin - and with great taste. FLF parent was Pandora's Box, so we should a wide variety of flesh and skin color combos in future generations from this cross. I am just starting with breeding and your blog is full of interesting and simply explained information. Especially on colors and taste. You mention about the sucr gene that it was introduced in some commercial varieties. Could you tell me examples of these commercial varieties with sucr gene ?